Kelly's Korner: How can a weekend when we didn't do anything have such a long post? How can a weekend when we didn't do anything have such a long post? Friday - I got to leave work early so I hit the mall. I'm 34 and pregnant and I bought things at two stores - Forever 21 and Motherhood Maternity. Does anyone think that's weird? ha! I got a good pair of black maternity pants that should help me get through the next few months but I have to say I'm just not crazy about maternity tops so I went to forever 21 and got a long shirt that will fit me and still look somewhat trendy. Saturday was one of those great days where I didn't even shower until that night. I slept late, worked in the yard and cleaned the house. I finally feel good and I got caught up on things I've been neglecting. Mean while - Scott and Steve hit the gym and then went to eat at a new Fried Chicken place in town. They took Emily with them and Scott sent me these pictures from his i-phone. Good thing they hit the gym first, huh? For the last 3 years- I have taught 4 year old early Sunday School. This year the 3 year old teachers moved at the first of the year - so I ended up with both classes. It's been crazy to say the least. Today - we had SEVENTEEN 3 and 4 year olds - with just Scott and I to manage them. There were several times over the year when we looked at each other and said "Are we SURE we want to have children?" ha! Today was my last day. I won't be able to teach this year with the baby coming so I'm taking some time off. I may go back some time or maybe I'll teach youth girls one day. I'll miss the kids - they have been fun but I'm a little excited for a break! I had the MOST fun afternoon today. For the last few years - I have heard stories about our pastor's niece, Catherine. She has one of those amazing stories of someone who suffered with infertility so they decided finally to adopt and before that adopted daughter was born - she found out she was pregnant! So now they have a BEAUTIFUL daughter who is 15 months old and a precious son that is 10 months old. They have a double blessing. She has been such a HUGE encouragement to me in the last year - she has e-mailed me so many times and has just lifted my spirits. And today we got to meet in person because she was in town visiting her family. 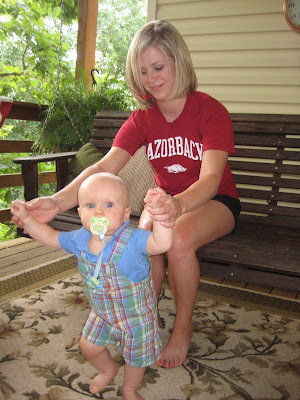 This is her son with her cousin Hannah. I told Scott when I left to go over there that I was only going to stay for an hour - maybe less and I ended up staying for 4 hours. I just had the best time. Catherine's mom and our pastor's wife (they are sisters) and Elizabeth and Hannah just kept me entertained with their stories. We sat on their beautiful deck and just talked and talked. I felt like I had know Catherine forever - she is just as friendly and sweet in person as she is in her e-mails. This is the two of us and her kids in this picture. I hope ya'll had a good weekend too!!!! Glad you're feeling better!! LOVE Forever 21!! OK YOU ARE SOOOO GOING TO BE SOOOOO HIP AND PREGNANT!!!!!! GIRL FOREVER 21 AND MOTHERHOOD WHATEVER STORE...EXCELLENT COMBO!!!!!!! YOU ARE JUST SOOOOOOOOOO PRECIOUS IN THAT PICTURE WITH ALL THE KIDS AROUND YOU...I LOVE THAT ONE!!!! you sound just like me when I was pregnant. I never liked the maternity tops so i always just bought cute, inexpensive tops in bigger sizes! good thing the whole peasant top trend was going on! Still til this day, I cannot wear a shirt that ties in the back! It just screams maternity!!! As far as your black pants, just put a new shirt with it and each day you've got a brand new outfit! I love wearing Forever 21 tops! I feel cute and not like a frumpy preggo!! Speaking of shopping on Friday, I saw you walking around the Promenade. I waved as my husband & I drove by...you probably had no idea who was waving at you! I hated Motherhood Maternity when I was pregnant, so I searched out and found this site. They have pretty trendy clothes and they're not too expensive at all. They probably wouldn't last three pregnancies, but for the price, they are great!! You can also find them for a little cheaper on ebay; all still brand new! Your posts are always entertaining. Wow! Catherine has an amazing story! I read an amazing story in People magazine about a lady that had the same experience. She had to endure chemo therapy and the doctors told her she would never be able to have a child. 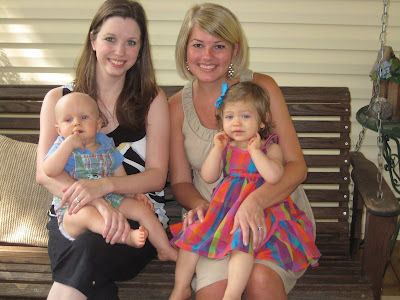 He sister agreed to be her surogate and just five months into her sister's pregnancy, she discovered she was pregnant! God does amazing this!! I can't even imagine 17 three and four year-olds!! I do Awana Cubbies (3/4 year olds) at our church and we have about 8-10 and that's a lot of energy in one room!! But you do fall in love with them, don't you? I know a lady that adopted and found out she was pregnant right after that, too! That's so neat. I think half of my maternity wardrobe is from Forever 21! It's great...plus you can wear it after the baby so you aren't spending tons of money on something you can only wear a few times! Josh and I start teaching 3-year old Sunday school next Sunday. It should be fun! I feel you having 17 in class! That is what everyday of my life is like...20 4-year olds in one classroom!! It's exhausting but lots of fun! 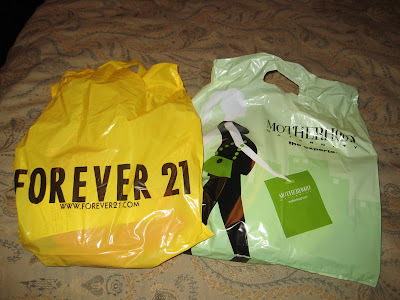 I have been loving Forever 21 too! All their stuff is cheap and flowing at the waist! : ) Aren't you glad the style this season is easy to wear being pregnant? I love it. I think that its hilarious that your husband is sending you pictures of what HE is doing to put on your blog. Too cute! My oldest daughter LOVES to shop at Forever 21 and I can see that they'd have all sorts of cute things for a "Mommy-to-Be" like yourself. You are entering some of the best times of your life, Kelly! Just by reading your posts, there is no doubt that your baby is going to be a very loved child. He/she is going to have great parents and grandparents. Kelly, you are just looking so darling these days! You have that pregnancy glow my dear. And good tip about Forever 21!! I'll have to file that away for when I need it! I'm sure you are going to be fashionable to the end! Glad you had a great weekend! It may seem like you didn't do a lot, but you did a heck of a lot more than I did! haha, glad you had a good weekend! What a GREAT weekend! I am so happy that you are feeling better ;)! I LOVED Motherhood Maternity when I was pregant! You can find some cute maternity tops at Gap.Com if you want something a little more trendy! You would be cute in a maternity paper bag, my friend!!! I know you will look darling in all of your new purchases! That pic with all the kids is TOO precious! And I could just cry at the awesomeness of Catherine's story. I love hearing things like that and I love the way she was able to use what she went through to help you over the past year. I LOVE that kind of stuff!!!!! The babes are beyond precious! I'm glad to hear that you are feeling better! And it sounds like such a sweet afternoon you spent with your friend and her family. It's so funny how well I have gotten to know some ladies through blogging/emailing! I would love to meet so many!! Love hearing about Catherine and her story of God's blessings. Her children are precious! You look so cute, and I love the picture of you with your Sunday School class...that is just the sweetest! Glad you had a great weekend! Oh, and how cool that your dad is blogging!!! That is too funny about the snack plates and the place for their cigarette! I was wondering what that was for. Can't wait to hear what you are having!! I saw Dr. Seale for an AI on Sunday so keep me in your prayers. That is your doctor right? Why didn't you show us your new clothes?!? Is that the new chicken place by Marias? Was it any good? My mind is stuck on food today! It looks like you had a great time with the girls yesterday! I know what you mean about maternity tops. I found a few cute ones at Mimi's and Pea in the Pod. Your friend got double the blessings! The children are precious. Seeing you with the children you look like a natural. You will make a wonderful mother. Those kids are adorable! I need to go to Forever 21 too. I stepped in one on Friday, but Ava was dropping her mall pretzel everywhere, so I decided to go back later!